Shortly after everyone said their goodbyes and I lugged luggage across London to the Eurostar – including a bike that Pierre wanted from England – and got on it (the Eurostar, not the bike) about 11 minutes before it left (the London tube, help! The Paris metro is like…riding a bike! ), an email came through from Beth from Dirty Kitchen Secrets, who is also she who we give thanks to for Food Blogger Connect. Competition! Win a 1-day pass to next year’s FBC! You had to request and use a cocoa, berries and flaxseed mix in a recipe, which I did. Two in fact. At, I think, 2 o’clock (don’t ask why, it’s like that) in the morning I was mixing, baking, and snapping photos, got something written a emailed it all off. “That’s great, Do you think you could have a recipe posted on your blog by Monday?…”. Mmm….no. Fast forward almost exactly one year…to last week. Competition! Well, not actually. Giveaway! Apart from Anjum Anand‘s presence, this year’s FBC will feature speakers on many aspects of blogging. like Steamy Kitchen’s Jaden Hair (who skyped her slot last year), Béatrice Peltre from La Tartine Gourmande, broadcasters or food writers Alex Mead, Fiona Beckett and Tim Hayward, and numerous others. So smoothies. What could be more simple, whiz a choice of fruit, ice cubes and optionally yogurt, milk, protein…together, in any combination you want. And hey presto, Pierre brings home half a watermelon from the market, I’ve got frozen blueberries in the freezer, and a punnet of raspberries in the fridge. I first made it last year, possibly minus the raspberries, and it was so good that I downed the almost whole litre in an afternoon. Plus it’s packed with antioxidants, blueberries having hit the headlines as a superfruit. Put the frozen blueberries in a blender and blitz a bit. 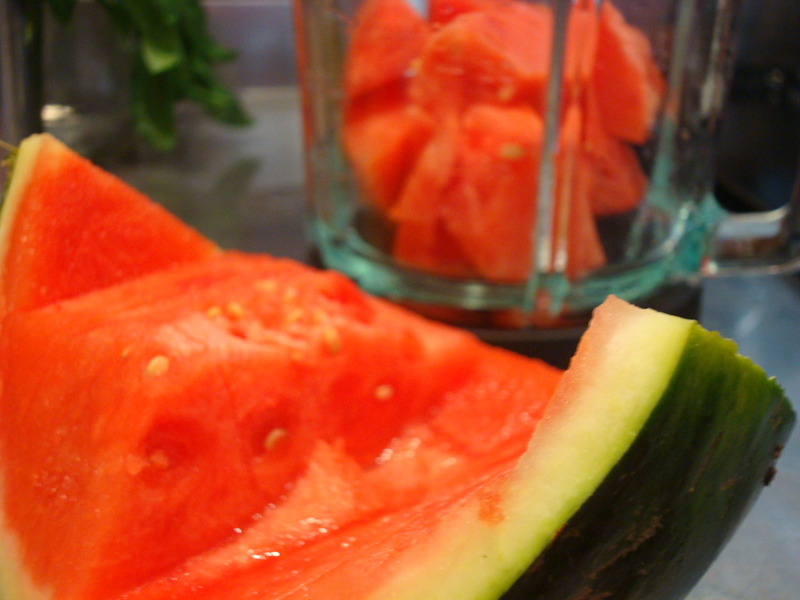 Add the watermelon and raspberries and blitz some more. Serve, decorated with fresh blueberries. 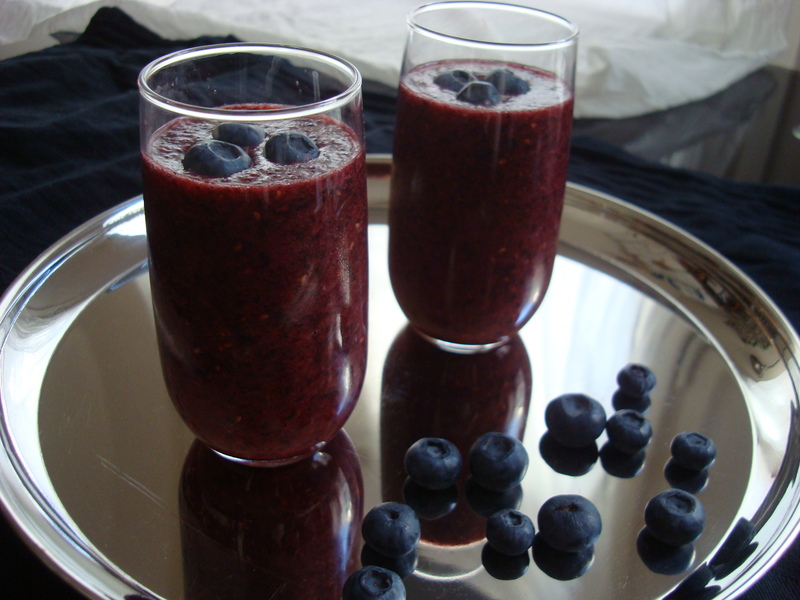 This entry was posted in Smoothies and tagged Anjum Anand, blueberry, Cuisinart, FBC, raspberry, smoothie, watermelon. Bookmark the permalink.